BROWNSVILLE TN (August 28, 2018): Tennessee music has many facets and “FACE’s,” as seen through the sketches of Paris, Tennessee, artist Shelia Fitzhugh. A show featuring her art will open Friday, September 7, at the West Tennessee Delta Heritage Center, Brownsville. The public is invited to the opening reception for “FACE’s of Tennessee Music,” and meet the artist from 6-8 p.m.
Fitzhugh is originally from Moscow, Tenn., but moved to Paris as a young child where she and husband, Keith, still reside. She currently serves as an electrical and instrumentation designer and on-site contractor for Chemours (Formerly DuPont) in New Johnsonville. The pencil sketches are drawn with a simple mechanical pencil/eraser with finger smudging and shading on plain paper. They feature musicians from all genres including West Tennessee legends such as Carl Perkins, Eddy Arnold and Denise LaSalle, as well as living artists such as Fuel’s Brett Scallions, Justin Timberlake and Loretta Lynn – just to name a few. While taking drafting in high school “before computers,” her teacher “Doc” Lassiter would often comment about light lines and ask her to apply more pressure on her pencil. Her sketches to this day still have that light touch. The work featured in the exhibition are the results of a 2017 New Year’s resolution and inspired by a friendship with her neighbor, the late Joan Turner, an award-winning wildlife artist. She began sketching daily in January of that year and renewed the passion she remembered as a child. Fitzhugh believes when looking for a passionate outlet, the key is “thinking back on things enjoyed as children, before we were molded or told what we should like.” She loved sketching and music then … and still does. More than 40 pieces will be on display during the eight-week exhibition that closes November 4. The exhibit is free and open to the public. For more information, contact the Delta Heritage Center at 731-779-9000 or visit westtnheritage.com. (Photo): Tennessee performers such as Brett Scallions and Valerie June are among more than 40 musicians captured with the pencil of Paris Tennessee artist Shelia Fitzhugh. 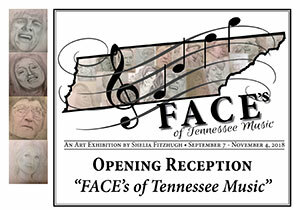 The exhibit “FACE’s of Tennessee Music” will be on display September 7 – November 4 at the West Tennessee Delta Heritage Center in Brownsville. Fitzhugh will be present Friday, September 7, from 6-8 p.m., for a meet and greet. About the Center: The West Tennessee Delta Heritage Center and Tina Turner Museum offers a refreshing Southern experience showcasing the music heritage and culture of rural West Tennessee. Inside, visitors can learn about the history of cotton, explore the scenic and “wild” Hatchie River and get to know the legendary musicians who call West Tennessee home. Also, located on the grounds is Flagg Grove School, the childhood school of Tina Turner now home of the world renowned Tina Turner Museum, and the last home of Blues pioneer Sleepy John Estes. The West Tennessee Delta Heritage Center is located along the Americana Music Triangle, the world’s #1 music destination – a preservation project along a 1,500-mile stretch of highway that birthed nine uniquely American genres of music (Blues, Jazz, Country, Rock & Roll, R&B/Soul, Gospel, Southern Gospel, Cajun/Zydeco and Bluegrass).